Check it out: All about dog training blog carnival 2nd edition! We have some great submissions for the 2nd edition of "All About Dog Training" for your reading enjoyment and your training edification. This month's selections offer you some useful nuances for the very basics of dog training. Read on for thoughts about teaching your dog their name, getting your dog to come to you when you're at the dog park, house training your dog on cue, and patience in your training regimen. Sarah Filipiak presents Teach Your Dog His Name - For Real, Though posted at German Shepherd Central. In this article, Sarah clearly articulates the clicker training method for teaching your dog his name. I plan to take her up on the free ice cream offer one of these days, too. Sarah's just getting her blog off the ground, so stay tuned for the barrage of getting-a-blog-started articles that are sure to be on their way. Next, Karen Shanley presents Housetraining Your Dog and Putting It on Cue posted at Karen Shanley: Author Mom with Dogs. Have you ever been standing outside on a brutally cold (or hot) day with your dog, waiting and waiting and waiting for "the business" to occur (and I'm not talking Flight of the Conchords business time here)? Imagine, in those moments, being able to make it happen with a verbal cue - and then head on over to Karen's blog to read about how to train your dog to do this very thing. Karen has been on writing hiatus recently to work on a different project, but her archives contain lots of valuable information about all sorts of aspects of dog training - along with some great slice-of-life writing as well. 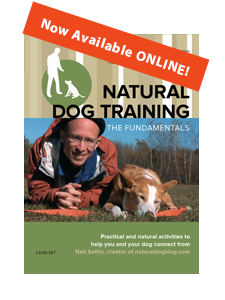 We also have a great article by fellow Natural Dog Training-inspired trainer Lee Charles Kelley: Coming When Called at the Dog Run posted at Lee Charles Kelley (his blog). His article discusses some strategies for teaching your dog to come when called that will work especially well at the dog park - and he also teaches you how to incorporate hide-n-seek to make yourself even more prey-like (and desirable) in your dog's eyes during this high energy situation. If you've ever wondered how you can work with your dog AT the dog run to get them to come when called, or had trouble getting your dog outta there when it's time to head home, this article will give you the solution you've been looking for. I had hoped that my new NaturalDogBlog design would be in place for this carnival, but alas, it wasn't in the cards. In the spirit of "patience", for this blog carnival edition I'm going to direct you to this article here on NaturalDogBlog.com: Patience and a Positive Mindset in Training: Turning a Problem into an Opportunity. In it I talk about changing your perspective when you're dealing with "problems" with your dog, and how important your filter can be in terms of accurately diagnosing a problem and coming up with a truly effective solution. Thanks for coming by for the 2nd edition of the All About Dog Training blog carnival, and thanks to our authors for their submissions. If you are also writing about dog training, you can submit your blog article to our next edition using our carnival submission form. Past posts and future hosts can be found on our blog carnival index page. If you have any questions or have a suggestion for an article, please let us know in the comments, or you can send e-mail to me at: neil at naturaldogblog dot com. Thanks for the great review! I'll definitely be checking out everyone's links.... Happy training. Neil, thanks for doing such a great job hosting. Love the articles. It's my pleasure - couldn't do it without the submissions! Having read your article on dog training, I think I may be in over my head. My situation is that I just agreed to take the big step and move in with my girlfriend of 2 years. The problem is that she owns and loves her dog very much, and I don’t particularly know anything about dogs. I really want my new living arrangements to work out. Actually, I am sought of uncomfortable around the dog and want to broaden my horizons, so to speak, on the subject, and smooth this whole matter out. I am interested in all kind of dog information and tips. I think familiarizing myself with this type of information will help with my anxiety around dogs. You're welcome, and congratulations on taking the big step! You can definitely find lots of information on this site (and the other sites featured on the blog carnival) to help you in your journey. If you have any specific questions about things that make you uncomfortable feel free to ask them, and we can address them directly. As a general rule, though, if you work on your own relaxation/acceptance and breathing, that'd be a good first step. If you can stay relaxed and centered, you're in a better position to respond effectively to any given situation. I’m Ayeanne. I have just moved into my first apartment, and I would like to get a dog. I would like to have some company and protection. My situation is I can’t decide on which dog I should buy. I love dogs, but this will be my first time actually owning a dog. So, I want to know all there is to know about dogs, the different kinds that can be protective yet loving, the cool kind, and the dangerous kind. You get the idea. Anyway, I welcome any suggestions or resources that could help me decide what kind of dog is the right kind of dog for me, and what I will need to do to make sure my dog is well cared for? Basically ANY kind of dog has the potential to be the best dog, and to fit the needs you describe. For a first dog, and considering that "protection" is something you want, I'd probably go with a medium-sized dog. In the 50lbs range. That's big enough to intimidate an ill-willed stranger, but not so big that you'll be physically struggling as a first-time dog owner. I know a lot of people are partial to this or that particular breed, but I personally like my mutt! As long as you focus on your training and developing your relationship with your dog, your dog will naturally be protective when it's appropriate. And relaxed when there's no danger imminent. The whole focus of this site is getting you to that place, so definitely keep reading and let me know if you have any specific questions. Thanks Neil. I kind of gather that any dog will become protective of any space it occupies after a while. However, I want to know what kinds of dogs are available that can be efficient at keeping unwanted guest out and letting invited guest in. I am also interested in knowing whether or not there is a dog that can be both protective and good with kids. I do plan to have one or two in the future. Without knowing more about your situation it's hard to make recommendations. However, that being said, there's one breed that comes to mind - Rhodesian Ridgeback. Every one that I've encountered has been a great dog, and they have a reputation for being good family dogs as well as protective of the family from outsiders. Still, the first focus of your training should be on building your relationship with your dog...save the protection work for after you have the foundations well-established. Let me know if you have any more specific questions.